So, this cake is actually pretty good (though I take off the fruit roll-up pepperoni because I’m not a big fan of fruit roll-ups). But, it’s pretty hilarious that it looks like a pizza. Since April Fools Day is coming up, I thought it would be fun to do a recipe that was kind of zany! So why not a cake that looks like something other than a cake, right? So…here it is! 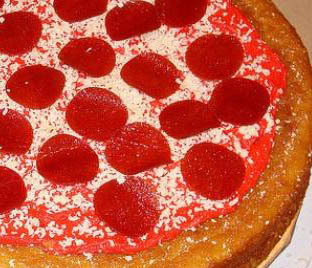 A Pizza Cake! (Plus my birthday was this week…so CAKE!) And you should totally make this cake and most definitely post pictures and show us!